"I am not sure if it makes sense to say that the food is prepared 'as fast as humanly possible' since, afterall, it is prepared by a robot. But that is the point right?" "Exactly; the robot does not exceed human speed. Besides a lot of cooking processes take set amounts of time anyway." "I think that is very huge and expensive. I invented it sooner than chinese, named it cookrobot. take a look at www.cookrobot.com"
"I made it sooner than chinees with more features and.... See WWW.cookrobot.com for more information." 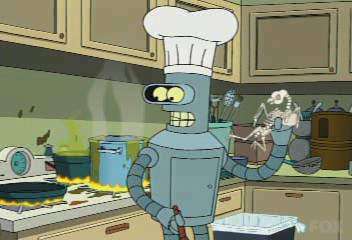 "Here's a screen grab of Bender, the 30% Iron Chef.